I've been thinking for a week or two about how to make a drama-free return to this little corner of the Internet that I've got here. I lost interest in the whole thing last year (obviously), but I never did say goodbye or officially shut things down, just so that I could come back if I wanted to. I'm still not sure whether I'll start blogging again with any regularity, but I have been finding myself wanting to post certain things, and this seems like the most appropriate place to do that. So hello to anyone who may pop by after all this time! I'm not going to try to summarize the nine months that have passed since I last posted, except to say this: I'm still living in Montreal and working on my Ph.D. (writing the dissertation draft). In news of the new, I'm expecting a baby in early December -- and that’s what brings me back to the blog. 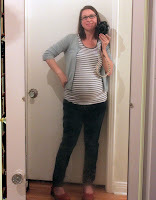 Yep, I'm 25 weeks pregnant and, I must say, feeling excellent. For me, Ravelry took the place of knitblogging. I could put all the info and photos about knitting projects there, and I no longer felt the need to duplicate that stuff here. 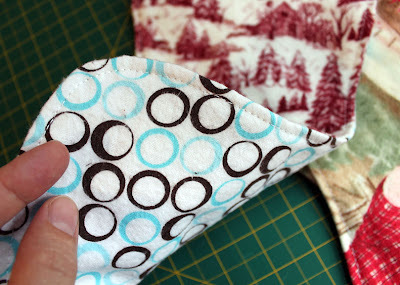 But now that a baby is on the way, I'm doing a little bit of sewing and bookmarking a lot of stuff online, and I don't have another place to keep track of that stuff. Also, I probably want to talk about baby stuff more than my friends want to hear about it, because -- let's face it -- stuff can be boring if it isn't about you. I'll be the first to admit that when knitting bloggers had babies and started talking about the babies instead, I often tuned out. If you're not interested, you're not interested -- and I wasn't, but now I am. Life changes like that, doesn’t it? All this is to say that I might start blogging a bit, and it's probably going to be about babies. OK, about my baby. (But I'm more interested in yours now, too -- I promise.) And I'm jumping right in with burp cloths. What could be more fascinating? I looked at several patterns/tutorials online and settled on this one. I cut out six pieces, paired different patterns together for each cloth, sewed the pieces together, and topstitched. Easy -- once I figured out the tension on my machine had to be set at 1 for the topstitching (only 1!?). Et voila. I'll probably need dozens more. Several patterns recommend layering a cloth diaper inside the burp cloth because some babies barf that much. This, along with about 273 other things I've read in the last five months, terrifies me. Congratulations!! Those are some snazzy burp cloths! Also, I stopped blogging because I'm boring and Ravelry has all the space for information I want to store about my knitting and my kids keep me too busy to do/blog about anything blog-worthy... and I'm not sure if I've ever left a comment to you before because I'm an habitual lurker... Delurking! Congratulations on the upcoming new human! Thank goodness for RSS feeds! I was glad to see your post today! I come here sometimes to check sock or skirt patterns! Congratulations on your pregnancy, and your feeling good! That is exciting! While I'm not a mom or mom-to-be, there is a serious wave of babies happening in my world. So: bring on the baby posts, if that's what you're into! Congratulations and happy to see you back blogging. I was excited when I saw a little 1 next to your blog name on my google reader. Congratulations!! I'm due in late November, so bring on the baby talk!! Cute burp cloths! Congratulations! So happy for you. So happy to see you again here on the bloggysphere, too. While you probably do not feel it, you look adorably cute! Welcome back and congrats! Congrats. I'd friended you on Rav awhile back to keep track of your blog updates and have noticed lately that you've been queuing or finishing a lot of baby projects, so it had me wondering. You're queuing has been helpful to me, since i'm expecting baby #1 in October. Sounds like a productive blog break! Yay for babies! Congrats. I am so glad to see you back blogging. I have checked regularly since Nov. 2009 but nothing until now. I knew you were still knitting from checking your Ravelry page. I don't normally post to blogs, just read them but I just had to say welcome back. And yes, if your baby is a spitter, you'll have spit rags every where in the house. It's all fun!!! hey girlie! congratulations! great to see your smiley face...and your (not really anymore but to me) brand-new baby bump!!! Never too many burp cloths, believe me. I made two piece thick flannel receiving blankets for my kids and then encored for the grandkids. Very thick and yummy. Just pre-wash the flannel, because the various prints shrank at differing rates. Congrats! I think it's awesome that a brainy baby will be joining us soon. welcome back, however often and for whatever you want to say, and super congrats on the baby, you look great :) good luck with the PhD work too. until the mogrunt was six months old he was one of those kids who spewed milk. I sometimes wondered if he wouldnt holler at me, "bring me a bucket!". I would go out with a friend who carried a tiny, thin baby facecloth to wipe up her daughter's spit up. 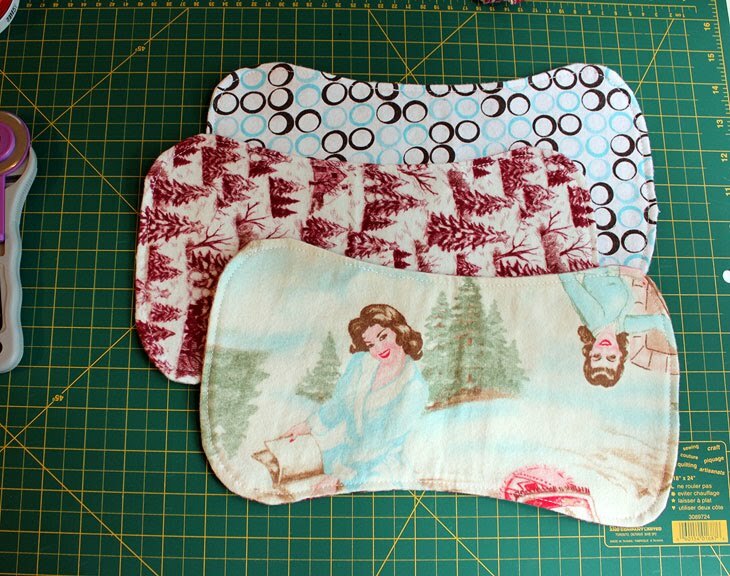 In the meantime, I had a dozen large, double-layered flannel burp cloths in my arsenal. You never know what your kid will need, and since they are so cute, I suggest you sew a few more. You can always use them for something else later. That is wonderful news Alison....massive congrats!...happy to see you back in this space! OMG! Congratulations Alison! I'm so excited for you guys! I embellished some cheap cloth diapers and I have to say that the size does come in handy. Not because Kate barfs that much necessarily but her range is vast. Congratulations, Alison! Very exciting, and those burp clothes will soak up baby barf just fine. I'm so glad to see you back again. I was always just a lurker, but I enjoyed your work and your thoughts expressed here very much. And you're on the nest - how great! Don't be afraid of the uurp-- it never killed anyone. And if you nurse(no pressure here- I'm just a 55-yo Mom and Nana who's been around more than a couple of babes) they don't really uurp much at all. But their diapers--- watch out! Congrats, and it's so good to hear from you again. Congrats! I was over on Ravelry last night and saw your baby projects and was about ready to message you when I saw your post. My baby (one month and one day old) is off on a walk with his papa, and I miss them both but the breaks are good. Love the burp cloths; I've been using plain diapers too. Some babies don't spit up much, but mine does. So, I'd say try not to worry about what could happen--especially since it turns out they do something different *every single day* to freak you out (and make you love them even more). Oh my gosh! Exciting! Congrats! Congrats on the new bundle. Enjoy the ride. How wonderful!!! Congratulations and welcome back to the blog! I hope to see baby progress when you can. I have a 5 year old son who is the light of my life. Congratulations! That is fantastic news. Maybe you'll be lucky & you won't have a puker! I had 2 and I got used to being a bit dirty for about 6 months. Those burp pads wouldn't have stood a chance against my angels. Wow ! What great news! Congrats. I figured something was up when you were favoriting a lot of baby stuff. Hope your pregnancy is uneventful. Trust me you will want it to be! And I hope the birth of you baby is truly joyful! Trust me, it will be. Congratulations! While I don't have a baby, I am happy to read anyone's happy news. Congratulations! I have missed your blog but I'm glad that you've been spending the time doing wonderful things! Holy congratulations! Early December babies are the best -- the newt was born December 3rd. jumping on board to say congratulations on the wee one and welcome back to blogland, i do hope you decide to stay. Welcome back, we've missed you. What a surprise to see an update from you! Congratulations!! I'll have to check out your Ravelry news as I've missed reading about your fabulous knitting. Wishing you the best with the baby and the dissertation. Congratulations! And welcome back to blogging. I had my first baby last October and am loving every moment of motherhood. Though currently the crafting is sporadic and the blogging, too. Good luck with your new little one! Let me reassure you, the terrified feeling is normal and will continue for many, many years. I have three children - two teenagers and one pre-teen. The things to worry about change but the general feeling doesn't. But despite that, being a parent is the most wonderful experience in the world. Nice to see you, and Congratulations! Please keep sharing as much as you feel like, and take care. Super cute burp cloths. Congratulations. You look wonderful. Item 274-you might want those burp cloths to be bigger after about 6 weeks. Seriously, though, don't pay too much attention to those 273-everyone has a unique experience. Enjoy. yay, congrats, Alison! with an almost 7 month old, I love to talk about all things baby. you look amazing, and I'm so glad you're feeling good! those burpcloths are so cute and yes you need about eleventy million more. HA. Clearly we've missed you. Welcome back and congratulations! Looking forward to reading more baby and non-baby posts. Congratulations and good luck! As a knitblogger whose life was taken over by babies, I hear you! They do kind of monopolize everything once they come on the scene. Glad to hear you're feeling good. Congratulations Alison! You look fantastic. Best wishes for you and Bill and the new baby. Congrats on the future wee one! I understand completely how working on a PhD can distract from blogs, life in general, etc. Yea for being at the dissertation point! Glad you're back. Congratulations!@!! I have been checking about once/wk and am thrilled to know you are back. I will wonder no more at what kept you away: life (new and existing). You look fabulously pregnant. So happy. Congratulations to you all. I've been checking a lot to see if you were back. Guess I missed the past couple of weeks. Congratulations to you and your new adventure. Sorry to read about no knitting or typing. Looking forward to reading your blog again. Long time reader but never commented. This is mostly a knitting blog. Maximilian was born on Dec. 10, 2010, so for the time being, I'm busy with him while taking a leave of absence from school. I've earned a "Proselytize Knitting" badge: see this post.